I want to share an example of a failure for a company to grasp the importance of customer experience management. If you have not heard, Customer Experience is a term used to describe the sum of all experiences a customer has with a supplier of goods or services, over the duration of their relationship. Customer Experience covers multiple phases and contexts including awareness, discovery, attraction, interaction, purchase, use, cultivation and ultimately advocacy or ranting (like I am doing). The story starts with me. I am an avid outdoors type person. I love having good ski, snowboard, mountain bike, kayak and hiking gear. I generally buy nothing short of the best as I've found myself in places where your life depends upon your equipment. Recently I bought some Vibram hiking boots from Mountain Equipment Co-op. 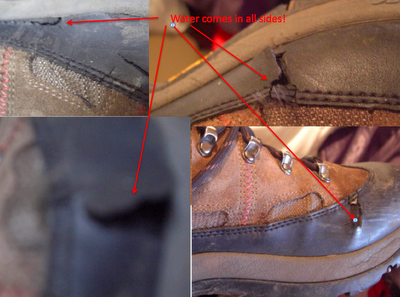 They basically wore out in about a year despite the fact they were only one of 6 pairs of footwear I used in that year. This includes the gaping holes in the toes and any of the plastic area. I called MEC which were very helpful but they said my best bet was to talk to Vibram myself. I went to the website twice now and left messages telling someone what happened and asking at the very least if they would contact me. I feel the quality of the boots is real bad and could have been possibly improved by the company examining them (I will otherwise not use them anyways). Anyways, long story short, no one returned any communication to me. The company has permanently lost me as a customer over this. They showed no consideration for me as a customer. Now while I rant about other companies on this blog with similar story (Rheem Water Heaters, Hillcrest Plumbing - both criminals IMO and The evil City Center Florists), I also want to commend companies that do really good things with customer experience. I recently made a post applauding Marriott Hotels for outstanding customer experiences. I've had similar great experiences with Shaw Cable Group, Delta Faucets (great warranty service) and others like Mountain Equipment Co-op. 1. If you run a company, you can no longer ignore the power of the people to spread bad news of horrible experiences via social media such as blogs, twitter, facebook etc. A simple person like myself can put such a message out and it will eventually reach potentially millions of your customers. 3. You need a platform to reconcile the multiple channels of experience into a single view at your company. This should take into account social media activities as well as data from existing business processes and CRM type systems. 4. Understanding the context of an experience is essential. This will probably involve ontology work or semantics for a shared understanding of the possibilities, meaning and concepts within an experience, with inside of and outside of the enterprise. 5. The old way of doing business is dead! Big multinationals cannot simply adopt the Ostrich move (stick your head in the sand until danger goes away). YOu must be proactive in ensuring your customers have the best experience or they will not be your customers much longer. In closing, if I owned stock in Vibram, I'd be selling it as fast as I can. Bad experience, shoddy workmanship and no desire to communicate with customers are a recipe for financial disaster. Have you ever written something that you won't have to take action on for a long time and then later thought "what have I got myself into"? I did just this by submitting a talk for Web 2.0 Expo, taking place this month in San Francisco, CA at Moscone West. I've spoken at the Web 2.0 Expo events several times before and they have been really valuable. What HTML5 brings to the table is “choices” for those who are implementing future applications on the web and in order to make decisions, an understanding of the forces working against their desired outcome needs to be facilitated. The speaker will look at several specific areas such as video and simple animations and show benchmarks and optimizations that can be done to create an overall good user experience. Data will be shared as well as hypothesis about when one technology may offer an advantage over another." - discussing possible definitions of what people really mean when they say "HTML5" (+ AJAX) and "Flash"
The last part will obviously be a wild guess. No one could have predicted that any consumer can use a 0.6 cm thick device with a 800 X 480 pixel display to access the full published knowledge of mankind 9 years ago. Thinking that such devices have GPS, HD video cameras, voice recognition etc. makes me wonder how the hell I can give an accurate description of the three technologies into the year 2020. I am therefore asking for anyone who has ideas to contact me. Not ruling anything out at this point! Crowd-sourcing is not cheating - just a great way to use collective intelligence. Labels: html5 flash, w2e, web2expo. I came across a great tutorial that is sort of like "the missing manual" for how to set up your development environment to use the FP 11 debugger. This has been announced with the "Incubator" program, along with new features including the “Molehill” 3D APIs for Flash Player and AIR and Cubic Bezier Curves (rocket science if you ask me). "These are early builds of Flash Player or AIR and may not be as stable as a final release. However, the current released features should still work as expected. AIR applications should be for developer testing only, and Flash Player builds are not recommended for use in your default, daily-use browser. The availability of AIR and Flash Player and supported OS and platforms may vary on the downloads page between updates to this program."